The coat of arms of Montenegro (Montenegrin: Грб Црне Горе / Grb Crne Gore) was officially adopted by the law passed in the Parliament on 12 July 2004. It is now the central motif of the flag of Montenegro, as well as the coat of arms of the Army of Montenegro. It was constitutionally sanctioned by the Constitution proclaimed on 2 October 2007. The charge is a two-headed eagle, a symbol of Byzantine and ultimately ancient Roman origin. It symbolizes either the unity of or the close connections between the church and the state. The motif was used by medieval rulers of Zeta—the House of Crnojević—as well as various other European dynasties. The layout of the Montenegrin coat of arms is inspired by that of the Russian Empire, with which the ruling House of Petrović-Njegoš had close dynastic and political ties in the 19th century when the coat of arms was first adopted in its present form. The lion passant on the inescutcheon is as a sign of episcopal authority and could have been conceived of as a metaphor for the Lion of Judah. Furthermore, it bears some similarity to the motif present in the arms of Venice, which had considerable influence in the history of Montenegro. After Montenegro regained its independence from medieval Serbia, it gradually became a theocracy to have a united front against the numerous Turkish invasions of the country. For this reason, the authority of the church was reflected in various insignia of the age. After the establishment of the secular dynastic succession in 1851, the lion was placed beneath the eagle, while the initials of the ruler stood on the shield: notably, that of Danilo I, Prince of Montenegro, Danilo II, Prince of Montenegro and King Nicholas I of Montenegro. Curiously, Danilo I was still a prince-bishop while the standard bearing his initials was used. The modern coat of arms placed the lion d’or back on the shield, erasing that monarchic symbol. Today, Montenegro is a secular, democratic republic, so the fact that the crown of the Petrović-Njegoš dynasty was also represented created some controversy at the time of its adoption. However, this configuration proved extremely popular. The coat of arms can be seen not only in public places such as schools and governmental offices, but also in many private houses, places of business and private universities, due to being a common display of national pride. The coat of arms and the flag are used in the shape and contents determined by law. The use of the coat of arms and the flag is free in artistic creativity and educational work, in manners not disturbing the public morale, reputation and dignity of Montenegro. In the coat of arms and the flag, it is not permitted to correct, add or change anything. Exceptionally, if so determined by special regulations, the coat of arms and the flag could be used as a component of other emblems or signs of the state bodies and other institutions. The coat of arms and the flag can not be used as merchant or service seal, sample or model, nor as any other sign marking the merchandise and services. The coat of arms and the flag cannot be used if they are defective or otherwise inappropriate for use due to the unsuitable appearance. A defective or unsuitable for use coat of arms or flag are revoked from use. When displayed in Montenegro together with one or more coats of arms of other states or international organizations, the coat of arms takes the place of honour. The place of honour is considered the central place in a circle, the top of the semicircle, the first place in a row, column or group of coats of arms, the place on the right, as seen from the front, from the coat of arms of another state or international organization. On scripts it takes place on the top center or upper left angle. On identity cards of members of the parliament, members of the government, judges, inspectors and other officials. In other cases defined by the law. The history of the state coat of arms begins with the Crnojević dynasty in the 15th century. Their family arms – a golden crowned two-headed eagle on a red background – laid the foundation of the Montenegrin state heraldry: the two-headed eagle became the standard symbol of the state. 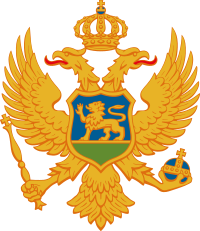 After gaining power, the Petrović-Njegoš dynasty took the golden two-headed eagle as the state symbol. Vladika Danilo charged on its breast the Great Arms of the Petrović-Njegoš family (shield, crown, mantling), while his successor vladika Sava made major changes to the coat of arms: he removed the family Great Arms from the eagle's breast, and added a sceptre and a globus cruciger ("the imperial orb") in its claws. He also added another symbol retained until present day – a golden lion passant – below the golden eagle. With Petar I, further rearrangement of the coat of arms took place: he removed the royal insignia from the eagle and charged the eagle's breast with the Middle Arms of the Petrović-Njegoš while leaving the lion passant. Prince Danilo also reorganised the coat of arms: he charged the golden eagle's breast with a shield with a blue background and a golden lion passant on green ground. In one claw the eagle held the orb, and in the other a sword and a sceptre. In the time of King Nicholas I, the sword was removed and later, in conformity with the Constitution of 1905, the colour of the eagle was changed from golden to silver as well as the colour of the inescutcheon – from blue to red. After World War II, Montenegrin statehood was reestablished and Montenegro became a federal part of the Second Yugoslavia. A national emblem was adopted in 1945 and it was designed in socialist style: Laurel wreath with Red Star, while the central motive was the Chapel of Lovćen with sea waves in the background, representing the Montenegrin sea access. The national emblem of the Federal State of Montenegro was made in 1944 by Milan Božović, it was stylised in 1946 by Milo Milunović, and afterwards slightly changed in 1963 and 1974 (the shape of the red star). In 1993, the Montenegrin parliament introduced a coat of arms proper, returning to historical heritage. The old Montenegrin state's coat of arms was restored, but redesigned in the style of the federal coat of arms which were official adopted on 6 January 1994. This page was last edited on 20 March 2019, at 05:15 (UTC).